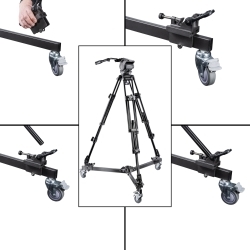 The extremely sturdy and robust tripod dolly by mantona rests on 3 multi-directional wheels which can be moved smoothly and easily due to their rubber coating. 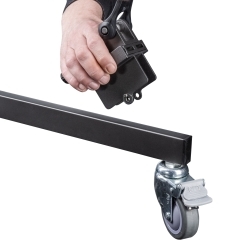 The locking of the wheels is done with individually lockable foot locks. 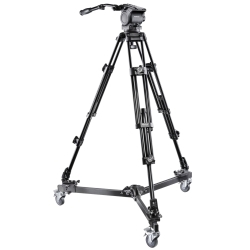 It is particularly well-suited for video tripods with dual spikes but also simple video tripods can be locked in with a clamp. The quick-release plates are equipped with rubber nooses on which tripods with dual spikes can simply be hooked into. 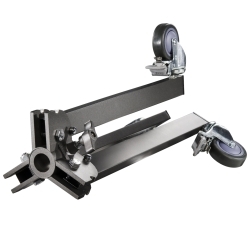 The locking plates on it make it easy to find the right leg angle setting. 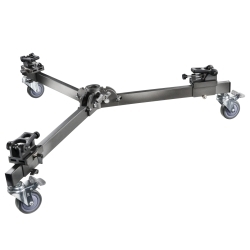 The Tripod Dolly is characterized through its highly professional quality. Due to its sturdy build, it has a load capacity of approx. 10kg. 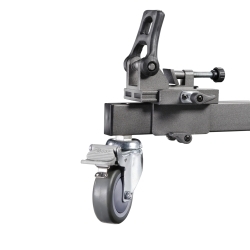 The tripod dolly can be folded to a transport length of 52cm after loosening the locking pins and previous removal of the adapter plates. 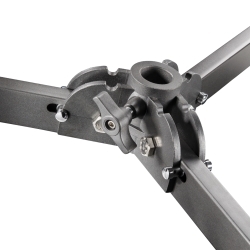 It can be moved smoothly on even surfaces and is also suitable for lamp tripods and studio flashes etc.